MORE THAN 3,000 people attended the ‘HeckmondLight’ event on Saturday night, with a giant flaming momentum wheel marking the countdown. 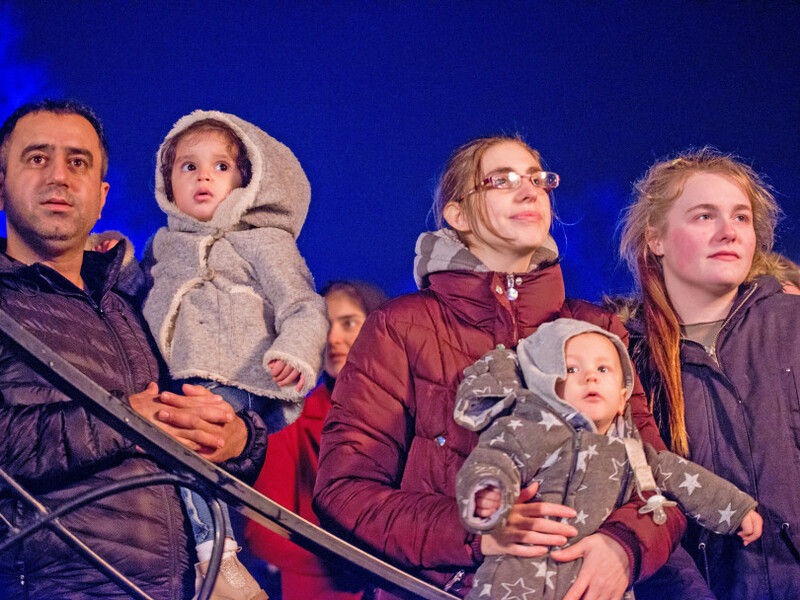 The town of Heckmondwike hosted its festive lights switch-on with a difference, attracting huge crowds to see art installations and cultural activities, as well as the annual lights switch-on – engineered by Santa Claus. Green Park in the town centre was transformed into a magical world of light and wonder with illuminations galore, flaming gas jets and lanterns made by residents. There were fun-filled family activities, as well as a street market and fun fair, all organised by the Heckmondwike Community Alliance with support from Creative Scene, which uses Arts Council England funding to make it all possible. The town’s illuminations can be traced back to 1868, when electric lights heralded the opening of the new market – long before Blackpool got in on the act. Heckmondwike, one of the first towns in the country to have electric illuminations, had its first Christmas lights in 1885. Nancy Barrett, director of Creative Scene, said: “The town is updating 100 years plus tradition with new commissions from artists and bringing the town out for the annual countdown. “The momentum wheel, created by Yorkshire artists Andy Plant and Chris Squire, once again took centre stage. Simon Thirkill, community producer of HeckmondLight and chairman of the Heckmondwike Community Alliance, said: “I am massively proud of what we achieved as a town and how the community has become an integral part of this annual event. “Students from the Brian Jackson College and Kirklees College, as well as school pupils, created their personal take on Heckmondwike’s illuminating heritage and the future. “It has perfectly paid tribute to our tradition of illuminating the town, which started with fire, using gas light back in the 1860s, long before that other town we don’t mention. Electric lights followed and today we see its natural progression into projection LED and digital technology.